I LOVE chairs. Chairs with personality make me happy. I guess I’ve always had a bit of a chair obsession. And as a result of my obsession, I usually have far too many chairs in my house. Lately I’ve been loaning chairs to our church and consequently our chair population at home has died down to where we almost have a chair shortage now. Ha! But that means I am free to look at new chairs without guilt, right? I kind of love giving stuff away because it gives me permission to shop again. Just kidding, Kind of. Not really. Our dining room is one of the rooms that recently got new hardwood floors. This photo was our dining room before the new wood, when we had carpet (layered with a seasgrass rug). Have I mentioned lately how much I love my new hardwood floors? Lowe’s did a fantastic job and I couldn’t be happier with how the floors turned out. My goal for today is to clean up all the construction stuff that was tossed in the dining room over the past few weeks and put my house back together again. It feels like forever since I’ve had a clean house. Then once I get all the empty product boxes and random stuff put away I can take some pics so you can see how the floors turned out in the living room and dining room! We eliminated our kitchen table and chairs in the kitchen redo because the room just wasn’t large enough to hold all those pieces. We are really trying to streamline our home and pare down on furniture since most of our rooms are on the small side, so we decided two dining tables just weren’t necessary on a day to day basis. Since our dining room is right off the kitchen, the dining room will be our main sit down eating space so we can forgo a full sized table in the kitchen. I do have a plan for eating in the kitchen, though. More on that idea later. I’m really into a casual cafe-like vibe, rather than the formal dining room look, for this house. 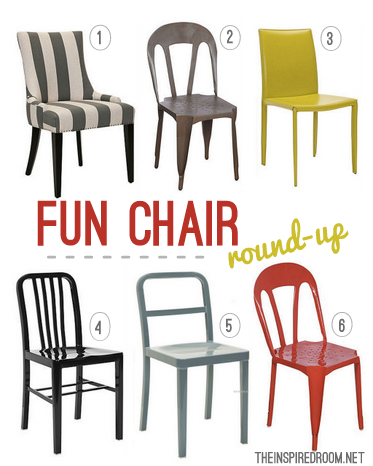 I love the fun style of the chairs in our collage and think they could work in many different types of rooms. We found these particular chairs at One Kings Lane if you are looking for similar chairs, they have a great collection of not only chairs, but other furniture as well. 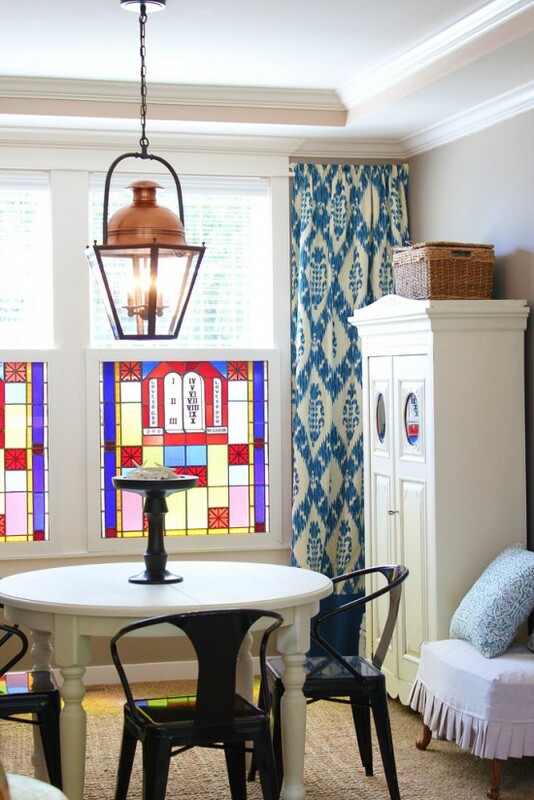 Do you have a formal dining room, a casual dining space or both? I’ve always longed for an eat in kitchen but the houses we always ended up in had kitchens too small to accommodate that. And now that it’s only the 2 of us, most meals are eaten, on the couch ,in the tv room. Oh, no! We’ve turned into our parents! We have an eat in kitchen but the eating area is large enough to seat 8-10 if necessary. I really like it. It’s the only eating area we have. But on the chair issue, I thought that I was the only one who “collected” chairs. LOL! My husband asked me once what was the deal. Whenever he would go antiquing with me, he noticed that I spent a lot of time looking at chairs even if we had no place to put one. Yeah what is up with that? I am always drawn to chairs! Like a magnet. I agree, Melissa. I am all for a bit more casual, too. We do have a dining room and a breakfast room, but if I was building a new house I would go with one combined living space. We never used our shoved-in-the-back-of-the-house-dining room so we turned our large kitchen/dining room combo into the kitchen/project room. Now Dad, kids and I have a place to be together in the evenings during homework/dinner/art time. We either eat at the small breakfast bar or what I refer to as “Asian dining” at the living room coffee table.. but we’re still eating as a family and that counts, right? We have a great-room style home where the kitchen / dining / living space are all open to each other. It works for us, though I must confess we have done our share the “Asian style dining” mentioned above, as well as many picnics on the living room floor. I agree – togetherness is what counts! I can’t wait to see how your formal living room/dining room end up. We are moving into our new to us home next week and will have a very similar layout. We are moving from a much smaller house and have the opportunity to think about these spaces before buying furnishings. Our kitchen has a huge island as well as space for a table and I know we’ll eat in there 95% of the time. The idea of a space being furnished & just sitting there waiting for that other 5% makes me a little batty. . . . .
You are doing so many wonderful projects on your home, I am totally excited for YOU!! Melossa, I too love chairs. Right now my obsession is with anything seagrass. I have been looking for some for my eat in kitchen. I have a formal dining room as well but with the “empty nest”, my husband and I eat in the den or on the screened porch when it is not too hot. I will continue my search for the seagrass! Have a great weekend! Oh thanks!! They came out of an old church that was being demolished! Sooo happy to have them! The colors are fantastic and they help hide a less than perfect view, too! I go back and forth on just using our dining room (where we eat now and did in our old house) or using the “breakfast room”. Its the first time we actually have a eat in Kitchen/great room and I just obsess over the idea of a little round table and cute chairs (BTW I love One Kings Lane). BTW, we did you get that table in the pic? It is a pottery barn table! Every kitchen I have ever had—-had an eat in kitchen ….love them. I at times wish I had a formal dinning room. Now I’m looking for a round table, benches and odd chairs….for the mill house. Love your thought process in designing. We eat in only one place- the kitchen. We turned our dining room into an extra living room which we use a LOT. I am envious that you are just about done with all the renovations! We had a leak under our dishwasher which ruined our flooring and cabinets and we are working with Lowes to get everything updated and back together. But it seems like forever before I will be at your stage! My courage is flagging. I am extremely grateful that insurance will cover most of it and our kitchen will be way more “with it” when all is done. It is nice, too, to hear such a glowing report about Lowe’s home services. Congratulations and much happiness to you! Love chair number one! Love the stripes on them. I have what you probably consider is an eat-in kitchen (no separate dining room). It comfortably seats 6, but I bought a Martha Stewart bench from KMart years ago that can be pulled up on one side of the table and then the chairs can be squished around to seat 8 or 9 in a pinch. I absolutely love the chairs in your dining room. We have a casual dining area that we use whenever I slave away in the kitchen. ;-) It’s fun to gussy-up the table and enjoy a sit-down dinner with my husband — I love it!